Percutaneous coronary intervention (PCI) with stent placement is a standard therapy for myocardial revascularization in patients with hemodynamically significant coronary artery disease (CAD). Coronary CT angiography (CCTA) as a noninvasive imaging modality allows for a reliable evaluation of coronary stent patency and has been incorporated into current accepted guidelines. However, due to detrimental artifacts caused by stents, the role of CCTA as an appropriate evaluation tool remains controversial. 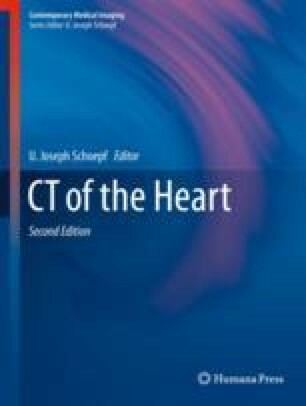 In this chapter, the clinical background, scanner technologies, acquisition protocols, image reconstruction techniques, and CCTA imaging findings of in-stent restenosis are discussed.